They are reliable. They are company independent. They are always completely up-to-date. RAL Gütezeichen (Quality Marks) differ from other labels because the RAL quality assurance system guarantees that they are neutral and objective. In addition, the Quality Assurance Associations regularly check the Quality Assurance and Test Specifications, adapt them where necessary to new requirements and thus keep the regulations up-to-date. RAL Gütezeichen (Quality Marks) are thus an independent, objective validation for quality assurance that represent a consistently monitored level of quality. RAL Gütezeichen (Quality Marks) stand out due to their high level of reliability, strict neutrality and up-to-date nature. The basis for the quality marks are the fundamental guidelines for RAL Gütezeichen (Quality Marks) that control the approval, issuing and monitoring of the quality marks. This distinguishes RAL Gütezeichen (Quality Marks) from all other labelling. 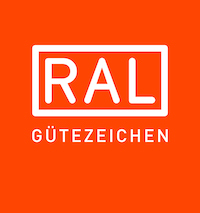 RAL Gütezeichen (Quality Marks) are based on strict rules and are approved by the RAL Deutsches Institut für Gütesicherung und Kennzeichnung (RAL German Institute for Quality Assurance and Certification). The Quality Assurance Associations award companies the right to carry the quality mark, monitor adherence with the quality assurance specifications and regulate the use of the quality marks. They have the right to penalise any infringements and to take action against any misuse of the quality mark. Infringements against the regulations are penalised, which can even lead to the withdrawal of the quality mark. Companies obligate themselves to adhere to the Quality Assurance and Test Specifications and also to monitor this compliance themselves. In addition, companies are regularly monitored by independent bodies, institutions and certified experts. The content and scope of the quality assurance system are transparent for everyone because they are made publicly accessible. In an approval procedure together with manufacturers and suppliers, the trade and consumers, testing institutes and authorities, RAL determines the individual requirements for the relevant quality mark. Adherence with this special level of quality is determined, for those companies who offer their product or service with a quality mark, in an initial testing procedure and then afterwards through constant self-regulation and neutral independent monitoring. The Quality Assurance and Test Specifications are controlled by the Quality Assurance Association. If technical requirements or market expectations increase then the quality assurance specifications are adjusted in a RAL review process.